Athens, Ga. – The University of Georgia College of Veterinary Medicine welcomed the class of 2018 during its annual White Coat Ceremony held Aug. 17. 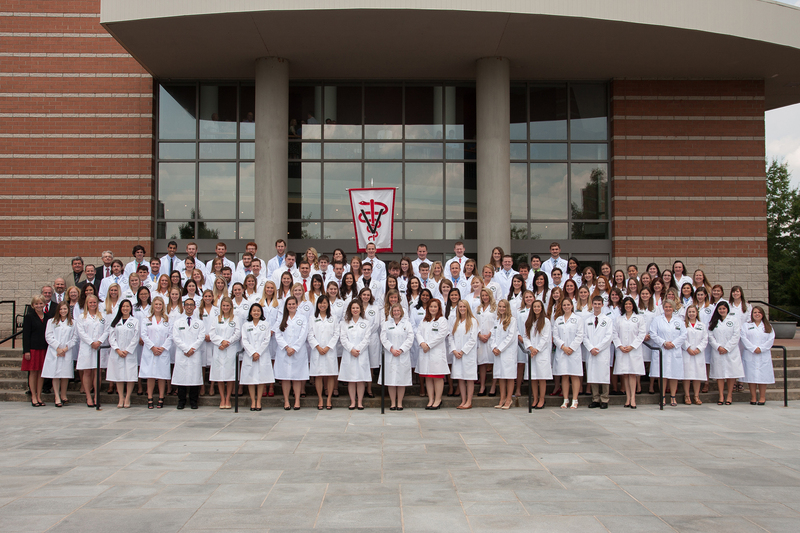 Sponsored by the Georgia Veterinary Medical Association, the event officially recognized 114 members of the incoming class by donning them in lab coats to be worn during their veterinary education. The hour-long ceremony was held in Hodgson Hall at the UGA Performing Arts Center. It was followed by a reception with the students’ families and members of the college’s faculty and staff. Of the incoming class, 19 percent is interested in companion animal medicine, 30 percent in mixed-animal medicine, 10 percent in zoo animal and wildlife medicine, 10 percent in food animal medicine, 8 percent in public health, 3 percent in equine medicine and 20 percent in pursuing a post-DVM internship/residency. “The white coat is a symbol of medical professionalism and of acceptance of the responsibilities, obligations and sacrifices that go with the privilege to study and practice veterinary medicine. Reciting the Veterinarian’s Oath for the first time denotes the beginning of their official journey in one of the most respected professions,” said Dr. Scott A. Brown, the college’s acting associate dean for academic affairs. The UGA Veterinary Teaching Hospital treats more than 24,500 small and large animals each year and offers 25-plus specialty services, including a 24-hour emergency service. For more information about the hospital, see www.vet.uga.edu/hospital. The college is constructing a new hospital and classroom building, which are slated to open in spring 2015. For more information, see www.vet.uga.edu/VMLC.